1. ⛳️ He did it. Tigers Woods did it. Tiger Woods won the Masters yesterday — his 15th major victory and his first since June 2008, when the Seattle SuperSonics were still an NBA franchise and Uber had yet to be founded. 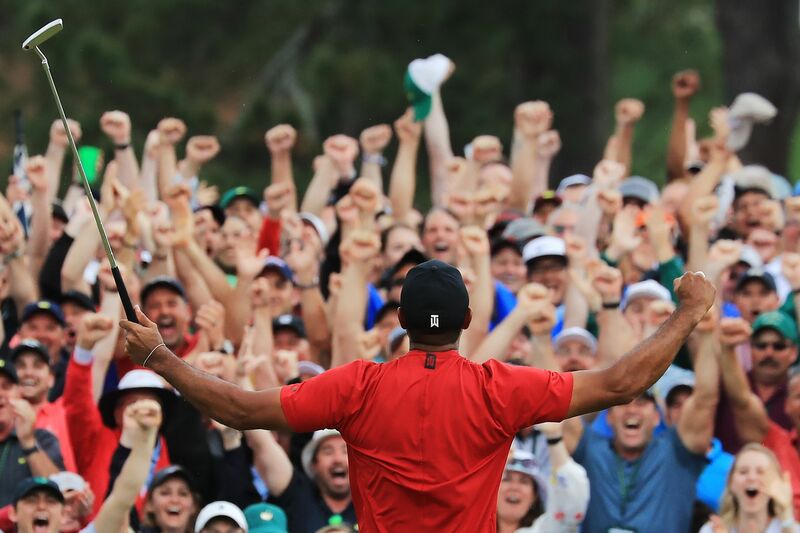 Why it matters: Tiger's win at Augusta matters for a million different reasons, none bigger than the fact that it answers the most lingering question in sports. For the past decade, we've debated whether he could win another major, with the believers arguing that the once-dominant athlete was still in there somewhere, while the skeptics asked, quite simply: Have you seen him play golf lately? The big picture: We didn't know if we'd ever get world-conquering Tiger back. Now that we have, it's as if his extraordinary but faded career has been given new life. And when I say new life, I mean both in terms of the future (how many more can he win?) and the past, as the entire narrative surrounding his career has been forever changed. "It no longer feels like dusting off the books to talk about When Tiger Woods Was Great, about what a thrilling and transformative figure he can be," writes the Wall Street Journal's Jason Gay (subscription). "After all, there was a big chunk of time in which Tiger Woods felt [like] the biggest sports figure on the planet. This weekend, it felt like that again." 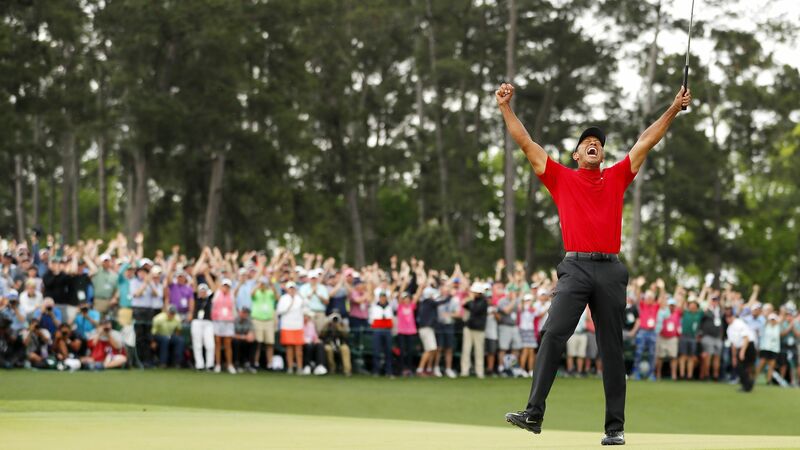 By the numbers: Tiger (43 years, 3 months and 15 days) is the second-oldest golfer to win the Masters, trailing only Jack Nicklaus (46 years, 2 months and 23 days old when he won in 1986). Tiger started Sunday's round trailing Francesco Molinari by two shots, but ended up chasing him down, marking the first time in his career that he came from behind to win a major. Masters wins: 5 (1997, 2001, 2002, 2005, 2019), which is second all-time to Nicklaus' 6. Major titles: 15, which is also second all-time to Nicklaus' 18. The bottom line: What transpired this weekend reframes everything that happened before it, turning a story of human fragility into one of human strength. Watch: Shoutout to Jim Nantz for doing what legendary sportscasters do and letting the moment speak for itself. The result is 4 of the best minutes in sports history. Above: We spend a lot of time thinking about what momentous occasions like this mean to us as sports fans. But what this means for Tiger and his family takes precedence over all of that. "Nobody who was here on this surreal Sunday ... will ever forget the scene of Woods' son, Charlie, falling into his father's arms like Tiger fell into his father's arms after his record-shattering, barrier-blasting victory as a 21-year-old in 1997," writes ESPN's Ian O'Connor. 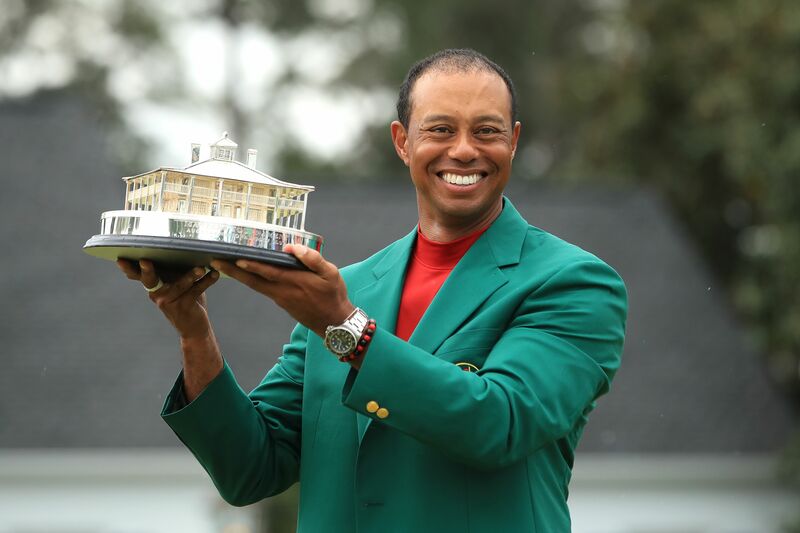 "Woods had said his children thought of him as a 'YouTube golfer,' as a dynastic force on internet highlights and video games but as something entirely different in the flesh." "'They only knew that golf caused me a lot of pain,' Woods said of his children. Physically and emotionally." Then yesterday happened. Gosh, I love sports. Above: The jacket still fits. Above: And the crowd still roars. Steph Curry: 38 points (11-16 FG, 8-12 3PT), 15 rebounds (not a typo), 7 assists in the Warriors’ 121-104 win over the Clippers. … P.S. He also became the NBA’s all-time leader in postseason threes, passing Ray Allen. D.J. Augustin: 25 points (9-13 FG) and 6 assists in the Magic's 104-101 win over the Raptors. He also hit the game-winning shot. P.S. ... His counterpart Kyle Lowry didn't score a single point. Derrick White: Plenty of players deserved this spot, but we'll go with Mr. White solely because of how nasty this dunk was. The second-year guard finished with 16 points on 7-10 shooting in the Spurs' 101-96 win over the Nuggets. Giannis Antetokounmpo: 24 points (9-17 FG), 17 rebounds, 4 assists in the Bucks' 121-86 win over the Pistons. P.S. ... This is just ridiculous (and probably a travel, but whatever). James Harden: 29 points (11-26 FG), 8 rebounds, 10 assists in the Rockets' 122-90 win over the Jazz. P.S. ... The Jazz used the Bucks' unique strategy of forcing Harden to drive by straddling his left hip instead of playing in front of him. Didn't really work, though. Enes Kanter: 20 points (8-15 FG), 18 rebounds, 2 blocks in the Trail Blazers' 104-99 win over the Thunder. Best guard play: D'Angelo Russell, Caris LeVert and Spencer Dinwiddie combined for 67 points in the Nets' 111-102 win over the 76ers. Alarming result for Philly. Best throwback game: How often do we see NBA teams fail to crack 90 points? The Celtics beat the Pacers 84-74 and even Brad Stevens was calling it a 1980's playoff game. 📺 Tonight on TNT: Nets vs. Sixers (8 pm ET) followed by Clippers vs. Warriors (10:30). From Mike Sykes: The Boston Marathon is one of America's most sacred traditions, dating all the way back to 1897. It happens every Patriot's Day. Kids are out of school. The Red Sox are playing. It's just an all-around great day. Why it matters: The race has taken on new meaning in the years since the 2013 Boston Marathon bombings that killed three and injured 183. It's become a symbol of strength, resiliency and pride. And even with tragedy so close in the rearview mirror, the marathon continues to bring out the best in people. Sarah Sellers, last year's surprise runner-up, is competing with the goal of becoming an Olympian in mind while holding down a near full-time job as a nurse anesthetist. Insane. Ben Beach, 69, is getting ready to run in his 52nd straight race despite suffering from a rare neurological disorder that affects his left leg. The bottom line: Tragedy doesn't shape us. We turn it into triumph instead. This race and its contestants prove it. Good luck to everyone participating! The Tampa Bay Lightning are currently down 3-0 to the Columbus Blue Jackets. It's the first time in history that the team with the best regular-season record lost its first three playoff games. It's also the first time in history that the Blue Jackets have won three games in a playoff series. Speaking of 3-0 series leads, the New York Islanders are up 3-0 on the Pittsburgh Penguins and look poised to get out of the first round for the first time since 1993. Four games tonight: Bruins vs. Maple Leafs (7 pm ET), Capitals vs. Hurricanes (7 pm), Predators-Stars (9:30 pm) and Flames vs. Avalanche (10 pm). Every series is tied 1-1 except for Capitals-Hurricanes (Caps up 2-0). USA 2, Finland 1: The U.S. women beat host Finland in a shootout to win their fifth straight gold medal. Plenty of controversy surrounding this one, as a questionable goaltender interference review nullified Finland's game-winning goal in overtime. Frozen Four Final: ICYMI, Minnesota Duluth beat UMass 3-0 to repeat as national champions. 22 years ago today, Major League Baseball permanently retired Jackie Robinson's No. 42 on the 50th anniversary of his MLB debut. Fun fact: 13 major leaguers were already wearing the number at the time of the announcement and were allowed to wear it until they retired. The last player to don No. 42? Hall of Famer Mariano Rivera, who called it a "privilege." Fenway Park (1912) and Wrigley Field (1914) are the two oldest ballparks in Major League Baseball. Question: What's the third-oldest MLB ballpark? Hint: It was built in 1962 and the team that plays there is in the National League. 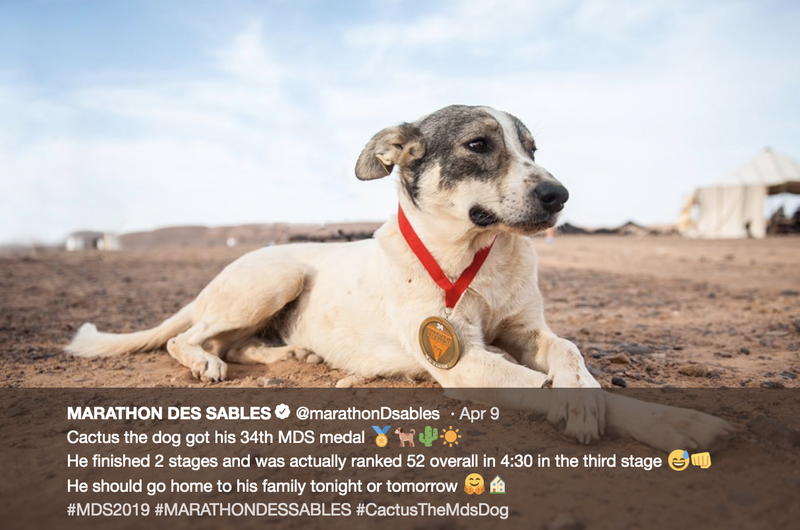 Meet Cactus, the dog who just sort of showed up and participated alongside humans in one of the world's most difficult races last week. Details: Cactus suddenly appeared during the Marathon des Sables, in which competitors run an average of 23.5 miles per day for five days straight through the unforgiving Sahara Desert in southern Morocco. Cactus linked up with his human counterparts following the opening stage but stuck around for the next four stages and 120 miles of running. Race officials assumed he would eventually wander back home, but that never happened. Instead, he slept in camp with runners where he was given food and water and ran alongside them when they took off each morning. What they're saying: Cactus' owner commented on a Facebook post that his name is actually Diggedy. She also seemed more than fine with him participating. "I am the owner and was told he had left the camp yesterday... If I can pick him up I will but I also know he's having the greatest time ... He is a nomad dog and often travels 40 km a day around this area just for fun. Please look after him and get him home." College basketball: LSU has reinstated Will Wade as its men's basketball coach. The two sides finally met to discuss the FBI wiretaps that showed Wade discussing paying a recruit, and apparently the school was satisfied with his response. Formula 1: Mercedes is the first team since Williams in 1992 to start a season with three one-two finishes in a row. Lewis Hamilton has two wins (including the Chinese Grand Prix yesterday) and one second-place finish, while teammate Valtteri Bottas has one win and two second-place finishes. Soccer: Premier League standings: Liverpool (85 points), Manchester City 83, Tottenham (67), Chelsea 66, Manchester United 64, Arsenal (63) … Mo Salah scored a gorgeous goal in Liverpool's 2-0 win over Chelsea. Skateboarding: I can't stop watching this. 1. Will the 76ers (-8) cover the spread against the Nets tonight? Know this: The Nets are 25-17 (59.5%) against the spread following a straight-up win — the most profitable team in the NBA in that spot. 2. Will Bruins vs. Maple Leafs go Over/Under 6 goals? Know this: Games 1 and 2 both ended in 4-1 scores ... 66% of betting tickets are on Under 6, according to the Action Network betting data. 3. How many points will Stephen Curry score against the Clippers tonight? Know this: Curry scored 38 points in Game 1 and is averaging 32.3 PPG vs. the Clippers this season.